A suit is a pair of jacket and trousers of the same cut, made from the same fabric, and supposed to be worn together. Such a simple definition of suit however denies the personality of suit and it is this personality which distinguishes suits from rest of the garments and it has made the suit an enduring element of a gentleman's outfitting. Suit; as it is important for men it is important for children also. All parents want their children to look the best and want them to wear the best clothes that will make them look smart, handsome and the best in the crowd. As children are aware of the latest fashion trends, excellent designer suits are available in the market with various colors and fits for all occasions. The children prefer to choose the attire and also the accessories matching it. Suit for children has to be chosen according to the seasons as well as occasions. 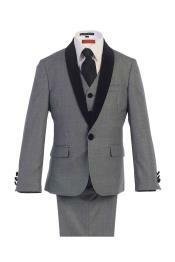 Some children prefer to dress up like gentleman and this formal suit is best for them. They can be used for special occasions like weddings, parties and other functions which will make them look adorable and more like a gentleman. Various colors and designs are available and the best among those can be chosen for children. They also give the children a more sophisticated look. Accessories for the formal suit is a must otherwise it looks incomplete and blank. Care has to be taken to choose the best accessories. Neck tie with lace and embroidery is the best as it gives a rich and luxurious look to the wearer. Suits for children should be bought with the correct size and fitting. If it does not fit the wearer accurately, children will feel agitated and uncomfortable. The quality of the suit should be taken into consideration when you buy suits for children. The quality gives comfort to the wearer and of the suit is of low quality it may harm the skin of the children leading to allergies and other side effects. 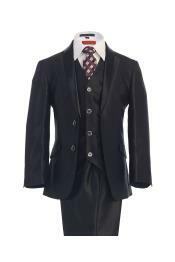 Quality, design and size play a vital role when selecting suits for children. Selecting an outfit for children is a hilarious task as it has to be according to the taste of the kids. Attractive and bright colored suits are the best choice as they get excited to wear them as it makes them look the best. Suits for children come in variety of colors ranging from black, grey, ivory, wine, gold, silver, brown etc. Children's suits look the best when it is worn by them. 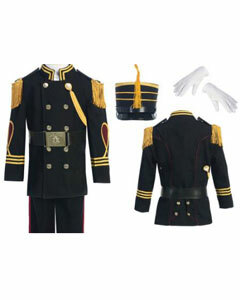 Morning suits and pageboy suits are the two varieties of children's suits. Fashion designers stitch perfect fit suits for children and the material should be chosen in such a way that it is comfortable and it does not irritate the wearer. When selecting a suit select the best as your children may look the best when attending any event. So invest your money on a best suit and your child will be sure to attract everyone's attention.